Case Studies List Biological Laboratories, Inc. List Biological Laboratories, Inc. (List Labs) was founded in 1978, and is headquartered in the San Francisco bay area. List Labs was the first to commercialize many bacterial toxins for research, including C.difficile toxins and pertussis toxin. Today, it remains uniquely focused on manufacturing, offering and supporting a wide range of bacterial products. 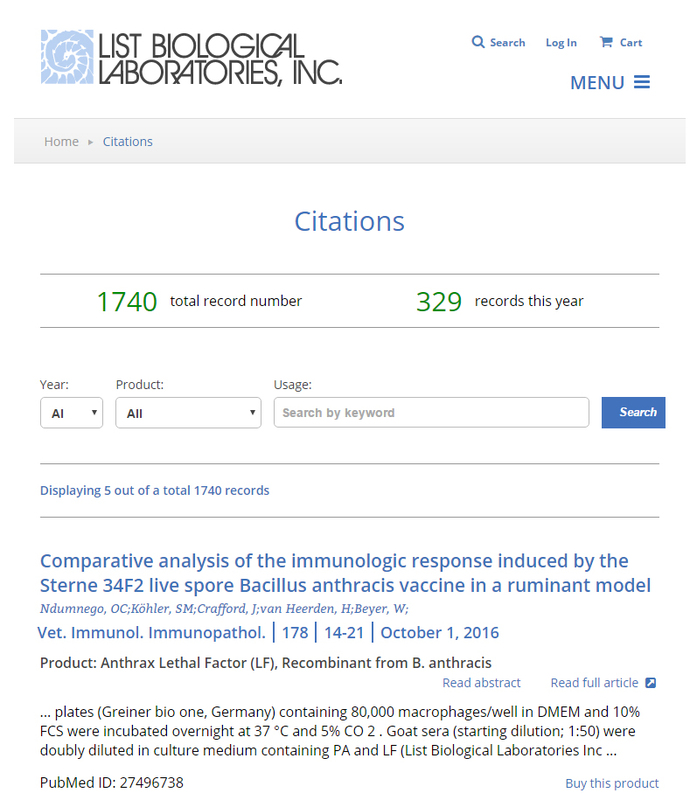 List Labs has been cited in more than 10,000 scientific publications, including many from top journals such as Nature and Cell. They did not realize they have been cited so many times until we contacted them. We help them to compile a comprehensive list of their publications with detailed information, including the cited product. They put the data into a searchable webpage and now their web visitors can browse and search any of the citations, and can also buy the cited product with a single click.